As we begin to address global challenges such as climate change, peak oil and over-population it is becoming apparent that we must re-orientate our society towards lower energy availability. This means that in the future, we will need to live in a world where our resources are produced and accounted for much closer to home. We will need to begin to live within the long term carrying capacity of our landscapes. A prototype Carrying Capacity Dashboard has been developed to estimate the productive capacity of the Australian landscape at various scales: national, state and regional. 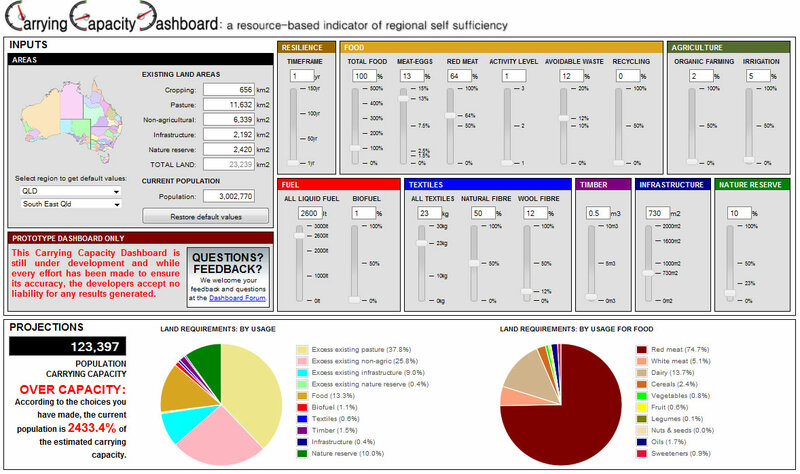 The Dashboard allows you to test how many people the resources of a certain area may support as well as determining how various lifestyle choices can influence land-use requirements. You can assess options such as a population’s diet, agricultural techniques, energy usage and recycling practices to gain real-time results. This form of modelling can help determine optimal placement, size and configuration of future human settlement as well as promoting societal behaviour consistent with the limits imposed by the natural environment. The Carrying Capacity Dashboard is a prototype only and is currently being developed by Murray Lane as part of his PhD at Queensland University of Technology. We value your feedback on the Dashboard, and also your contribution to the Carrying Capacity Blog below. Welcome to Australia’s leading carrying capacity website, featuring the Carrying Capacity Dashboard prototype and Carrying Capacity Blog. Our aim is to raise awareness of the importance of carrying capacity assessment as a forward planning tool - to help establish a sustainable balance between people and their localised environment. Given the dependence of societal systems on biophysical health, it is vital that land-use planning initiatives have the ability to more clearly define potential future demands on the environment. Carrying capacity assessment offers a way to assess our resource needs and also determine how best to meet these needs. assisting researchers and educators in highlighting system boundaries and physical limits to design proposals. helping individuals and local communities to more clearly define lifestyle changes necessary to ensure more resilient and sustainable societies in the future. You will find information on each component of the Carrying Capacity Dashboard just by hovering over it with your cursor. 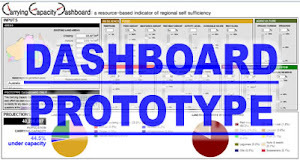 Essentially, the Dashboard tool will allow you to estimate the population able to be supported by a given region, according to the choices you have made concerning the production and consumption of resources. At present, this tool is only available for Australia and you can choose from national , state and regional estimates (based on Natural Resource Management areas). Every effort has been made to base the carrying capacity estimation on accurate, reliable and current sources of data, so in the majority of cases, it is sourced from government agencies such as the Australian Bureau of Statistics. However, because of human cultural flexibility, it should be noted that no human carrying capacity figure is ever likely to be definitive, so all results gained from the Dashboard should be viewed as approximate indicators. In order to generate results in the Carrying Capacity Dashboard, just alter the choices in the upper input section and view the outcomes in the lower projections section. This is predominantly a resource-based carrying capacity tool. So, please note that even though a region may be able to supply the resources necessary for a certain population, for a complete carrying capacity analysis, you would also need to consider any environmental impacts that the population may impart on the landscape. This impact aspect may ultimately reduce the potential population carrying capacity of any estimate. We hope to be able to also incorporate this feature in the future versions of the Dashboard. There is a section that tells you if you are over or under carrying capacity. This is just a comparison between the existing population and the estimated carrying capacity population. Default figures for existing land-usage are provided for each region. These include land available for cropping, pasture, nature reserve, infrastructure and non-agricultural land. However, it is also possible for you to override these figures and provide your own. For example, you may wish to test a smaller area within an existing region. In this instance, the average productivity of the entire region will be applied to the smaller area which may or may not provide an accurate estimate. Also, merely altering the total amount or proportions of various land-usages may not actually truly represent the characteristics of the original region. The Carrying Capacity Dashboard allows you to determine the impact that various lifestyle choices might have on land use requirements. For example, making relatively small changes to red meat consumption and biofuel production may have large impacts on land usage. Concerning land-use areas, there is a certain hierarchy of agricultural quality which reflects its potential usage. For example, cropping land could be used for pasture but not vice-versa, because the pastoral land may not be of sufficient quality. This approach assumes that the current usage is also its optimal usage. In some cases this may not be the case, but until accurate land capability mapping is conducted Australia-wide, land current usage rather than land capability offers the best data available. At present the model defaults to an ideal situation whereby the lower quality land type is utilised (if possible) before the better quality land. For instance, land required for additional infrastructure, by default, is first drawn from non-agricultural land, then pastoral land, then cropping land. In the real world this may not be the case, with urban development encroaching into good quality agricultural land. If this less optimal approach is to be taken then carrying capacity estimates are most likely lower than those offered by the Dashboard. Examining the excess land is one way of testing how changing the behaviour of the population might affect the carrying capacity of the land and in some instances improve the carrying capacity. For instance, if there is excess pasture land then you might be able to increase the carrying capacity by increasing meat or wool consumption. If there is an excess of non-agricultural land, then you might be able to improve environmental outcomes by increasing the nature reserve percentage. Alternatively, altering the timber consumption may also affect the non-agricultural land availability. The Carrying Capacity Dashboard is currently being developed by Murray Lane as part of his PhD at Queensland University of Technology. Please note that it is a PROTOTYPE ONLY and while every effort has been made to ensure its accuracy, we accept no liability for any results generated. We are seeking your feedback in order to improve this tool. If you have any questions or suggestions relating to the Dashboard’s functionality, purpose, visual appeal and societal value, please leave a comment in the User forum provided below the Dashboard. Please note that any comments may be published as part of Murray’s thesis. 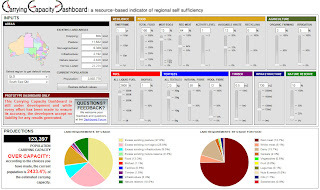 A big thank you to Alvin Sebastian and Marco Fahmi from QUT's Institute for Sustainable Resources for doing such a great job in converting my modeling into the Dashboard's online interface. Personally, I think your 'dashboard' is unnecessarily unwieldy. However, as I am preparing a minor thesis, I understand the requirements to cite peer reviewed work; however, for me, with respect to citing such work, my argument is that if no such work appears (even in Journals), this is not grounds to discount my observations. In fact, I believe that regurgitation of previously presented peer reviewed work contributes to maintenance of the existing paradigm (paraphrasing Einstein; you can’t solve the problem using the same thinking …) and to change a collapsing paradigm, a new one is needed. My thesis is titled ‘Investigating the Potential of Urban Permanent Organoculture Design Systems (U-PODS) in addressing Sustainability’ and my land carrying capacity is dictated by collectible potable rainwater sufficient to address historical rainfall data dry periods.